This is Sinclair II. He is a male African penguin with a yellow bracelet on his left wing. 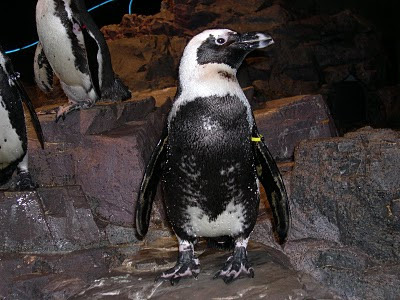 His parents are Benguela III and Bird and he was born here at the Aquarium on July 10, 2007. 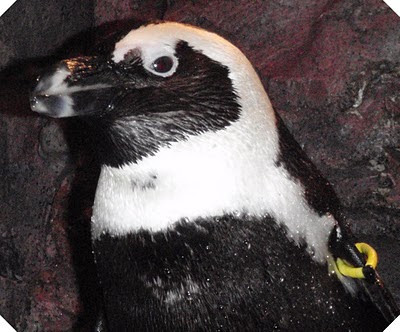 Sinclair is named after an African penguin breeding island off the coast of Namibia. It is located only 100 meters (just over 100 yards) off shore and is only 3 kilometers (about 1.9 miles) away from Plumpudding Island. Sinclair is Namibia's southernmost seabird breeding island. Each African penguin has their own unique spot pattern on its chest. Sinclair's spot pattern is very unique. He has such a high concentration of spots that half his chest is black! The interesting thing was that as a juvenile he had very few spots on his belly so we were surprised when he went through his first adult molt to his adult feathers and had all those spots! The next time you are visiting the Aquarium, try to identify Sinclair by his unique spot pattern. He should be easy to spot!